Lauren Middleton on Ironn Butterfly. Seth Petit Photography. Lauren Middleton, riding Ironn Butterfly, scored 219.5 points on Thursday, March 14, to win the NCHA Eastern Nationals $5,000 Novice/Non-Pro championship for the second consecutive year. Doug Secrest, Blacklick, Ohio, earned 218.5 points for the reserve championship aboard Dual Smart Sherman, while Missy Jean Etheridge, Corinth, Miss., placed third with 217 points on Rey Too Purdy. Together, Middleton and Ironn Butterfly LTE $106,965 were Non-Pro finalists in 12 limited age events, including the 4-year-old finals of the NCHA Super Stakes and NCHA Derby. On Wednesday, March 13, Middleton also showed the 9-year-old Just Playin Stylish daughter as a finalist in the $25,000 Novice/Non-Pro division, where Middleton placed third with 5-year-old Light Em Upp LTE $43,170, who she also qualified for the $5,000 Novice/Non-Pro Finals. 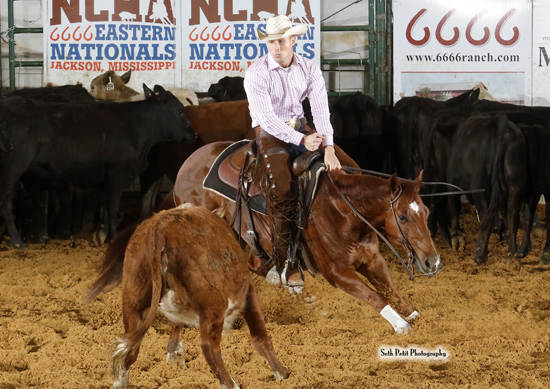 Middleton, the NCHA Non-Pro Hall of Fame earner of $719,699, has an impressive record of NCHA Eastern National Championship wins, including Non-Pro titles in 2002 with Widows Freckles, and in 2010 and 2015 with Cees Little Poo. She also earned Novice/Non-Pro wins in 2010, 2013, 2014, 2016 and 2018 with Cees Little Poo, Swoopn Indian, Spoonful Of Tears, Sweet Reyvenge, and Ironn Butterfly. Doug Secrest on Dual Smart Sherman. Seth Petit Photography. Doug Secrest, the NCHA earner of $101,377, showed both Dual Smart Sherman and Smooth Spyder Rey, in the finals of the $25,000 Novice/Non-Pro on Wednesday. Five-year-old Dual Smart Sherman LTE $25,500, by Dual Smart Rey, previously carried Secrest to place second in the 2018 Southern Futurity Unlimited Amateur and fourth in the Amateur Finals. Earlier this year, the gelding placed seventh with Gabe Reynolds in the Augusta Futurity Classic Open Finals. 6-year-old Smooth Spyder Rey LTE $69,854, by Smooth As A Cat, gave Secrest his first big Non-Pro limited age championship win, in the 2017 Congress Futurity 4-Year-Old Non-Pro. And last year, Secrest showed the gelding as a finalist in NCHA Eastern Nationals $5,000 Novice/Non-Pro and $25,000 Novice/Non-Pro. At the NCHA Eastern Nationals in 2015, Secrest placed third in the $5,000 Novice/Non-Pro with Ear N A Hat LTE $33,852, by Cat N A Hat, and the next year, was reserve champion in the $35,000 Non-Pro with Copencougarhagen LTE $28,201, by High Brow Cougar. Missy Jean Etheridge, the NCHA earner of $352,179, made her first mark in Jackson as champion, in 2004, of the NCHA Eastern Nationals $10,000 Amateur riding Pepto Jack LTE $33,436, by Peptoboonsmal. In 2010, Justa Lil Freck LTE $113,253, by Bobs Freckle, carried her to claim the reserve championship of the Eastern Nationals Non-Pro. 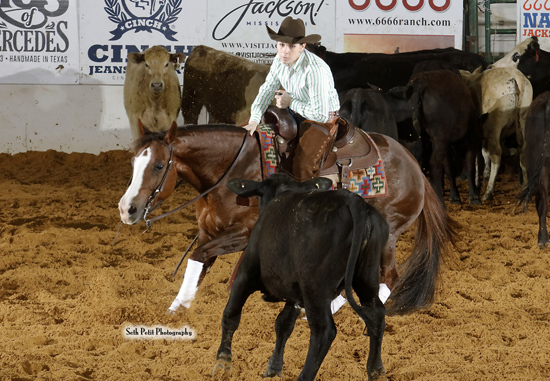 This year, Etheridge rode Rey Too Purdy LTE $35,299, by Dual Smart Rey, to place third in the $5,000 Novice/Non-Pro, where her husband, Vick Etheridge, placed fourth on 7-year-old Third Cutting daughter Cutting Commander LTE $90,887, who Missy also showed as a finalist in the $25,000 Novice/Non-Pro. In addition, Missy is also showing 5-year-old Blue Chip Dually LTE $4,247, by Dual Rey, and Light Of Grace LTE $93,509, by CD Lights, in the Non-Pro go-round on Friday.